I have become totally addicted to homemade Dulce de Leche. Although I liked it well enough when I bought a commercial brand, my fondness for it went up about 100% after making it from scratch. I hope the same thing happens to you once you try this recipe. I admit that my favorite way to eat this caramel flavored spread is from a spoon, but it is also great when poured over ice cream, used as a dip for fruit, spread on bread or even pancakes, poured over popcorn, used as a flavoring in homemade ice cream or yogurt, as a frosting, to sandwich two cookies together (especially in Alfajores), as a layer in Millionaire's Shortbread Bars, or in a Banoffee Pie (takes a pastry shell and fills it with Dulce de Leche, sliced bananas, and whipped cream). Dulce de Leche (pronounced DOOL-say day LAY-chay) is a rich, sweet, complex caramel flavored cream that is made by boiling down cow's or goat's milk, mixed with sugar, until thick and golden colored. Dulce de Leche means "sweet of milk" or "milk candy" and it is very popular in Mexico, Central and South America. It is also known as cajeta, arequipe, manjar or manjur, and doce de leite and is usually sold in cans, jars, or tubs in Latin markets and grocery stores. Some recipes make homemade Dulce de Leche by simply cooking a can of sweetened condensed milk until thick and golden colored. While this Dulce de Leche is good, I prefer making it from scratch. But making it from scratch does require one hour of your undivided attention, as it needs a lot of stirring. 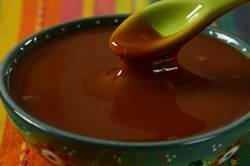 So, pull up a chair, turn on the television, and enjoy how your kitchen slowly fills with the sweet flavor of caramel. To make Dulce de Leche you start with whole milk, either cow's or goat's (try to use organic milk). Goat's milk gives the Dulce de Leche a slightly different flavor, with a distinct after taste. I have found goat's milk at my local grocery store, and it is definitely worth trying. Besides milk, you need some white granulated sugar, a few tablespoons of light corn syrup (or glucose), a little baking soda and salt. To cook the Dulce de Leche you will need a large 8 quart (8 liter) saucepan or Dutch oven as the milk does foam up as it comes to a boil. If you are like me and only have a 6 quart (6 liter) Dutch oven, you may have to remove the saucepan from the heat briefly once the milk starts to foam up, as there is the possibility of it spilling over the top of the saucepan. Just let the foam subside and then return to heat. Once the milk comes to a boil, reduce the heat to a simmer. You want the milk to cook at a low, rolling boil. Stir the bottom and sides of the saucepan frequently to prevent burning. After about 15 minutes of cooking, the milk will start to turn a light beige color. As it continues to cook, the milk will caramelize and eventually it turns a deep golden brown color with a thick, sticky texture. Total cooking time is between 40-60 minutes or until the milk has reduced to about 1 1/4 to 1 1/2 cups (300-360 ml). Dulce de Leche can be stored in the refrigerator for at least a month. To soften, gently warm in the microwave or on the stove. Continue to cook the milk, stirring the bottom and sides of the saucepan frequently, until the mixture becomes very thick and sticky and caramel colored (this will take about 40 - 60 minutes). It is important to frequently stir the milk so it does not burn. Adjust the heat as necessary, you want the milk to be at a low rolling boil. Note: There are several stages the milk goes through during the cooking process. When the milk first comes to a boil there is a lot of foam. Eventually the foam subsides and after about 15 minutes, you will notice that the milk turns a light beige color. As it continues to cook, the milk thickens and gets darker and darker in color. The more you cook the Dulce de Leche, the thicker and more caramel colored it will become. Once the Dulce de Leche has been reduced to about 1 1/4 cups (300 ml) it is ready. Remove from heat and strain, if necessary. Stir in the vanilla extract. Let cool before covering and storing. The Dulce de Leche can be stored in the refrigerator for at least a month. Makes approximately 1 1/4 cups (300 ml). Preparation time 1 hour.